There are definite registration benefits and the most important is that you want parents to seek you out. Parents have various child care options and you'll want to put your best foot forward as a professional child care provider by taking this step, showing them that you are the best choice for their children and the best In Home Daycare! In Iowa, (the state that I run my business in), we are "registered". So that is how I will refer to this process- Your state's requirements may be different or may call it licensing. Check with the Department of Human Services or Child Resource and Referral Agency in your state. Here is my introductory page on Child Care Regulations. Make sure you check on Registration Requirements. If you want Daycare Assistance make sure to take some time to investigate your options. - It's usually FREE! COOL! You'll have a certificate of registration that you can proudly display for parents, family, friends, and the public to see. You'll get a great feeling of pride and professionalism when you know that you meet the requirements of your state for quality child care. You'll be put on a referral list for parents, community organizations, and other agencies (free advertising) that are looking for a good family child care provider like you. You'll have access to child development trainings, daycare associations, grants, community resources, and assistance. 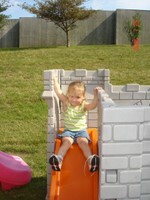 A grant helped me pay for my playground equipment! You'll have a support system from your local Child Care Resource and Referral where you can get help. They don't expect you to make huge changes in your home,in fact some homes don't have to have any at all! Your house doesn't have to become a mini daycare center! You get to keep it a family atmosphere! Again, check out potential Registration Requirements.